"From the outset, I've been impressed with SilverWood's professionalism. It comes through at every stage, with brilliant communication, quick replies to questions, and a real sense of coordination within their team. Having them take care of the cover design made everything seamless. I would highly recommend SilverWood to anyone looking for a publisher. In fact I've already sent several authors their way." Jill Treseder has a background in working with relationships, a theme evident throughout her fiction writing. Jill's passion for writing began at an early age and she remembers creating imaginary tales throughout her childhood. In a time when writing wasn't considered a legitimate way to make a living, Jill's interest in people led to a career in social work. She then made the leap to management development for a multinational company, focusing on personal skills training, team building and time management. Economic instability led to a shift to working at a more local level, and with a desire to explore further how soft values can evolve in predominantly male working environments, Jill enrolled in a PhD at the University of Bath. Jill's first book, The Wise Woman Within: Spirals to Wholeness, is a self development manual for women that evolved from her academic studies. It was during the writing of this book that Jill rediscovered the fiction bug and went on to write The Hatmaker's Secret, inspired by her great grandmother's past. Before publishing The Hatmaker's Secret, Jill experienced plenty of glowing rejections - letters full of positive feedback but ultimately, saying no. It was the arrival of a significant birthday that gave her the extra incentive to try self-publishing. Jill found a self-publishing service online and went through a far from satisfactory process to get her first novel out into the world at the end of 2013. Despite the struggles of her first self-publishing experience, Jill felt she had more stories to tell, and A Place of Safety began to take shape. On a recommendation from a friend, Jill approached SilverWood Books and was immediately struck by Helen's professional attitude and enthusiasm. "From day one, I've felt comfortable with Helen's team and the process of publishing with SilverWood. They are wonderfully responsive, and they always accept any issues I have, discussing them and feeding that back into their own process. One element I particularly liked is that their packages are all inclusive, so there were no extra costs to ambush me further down the line." 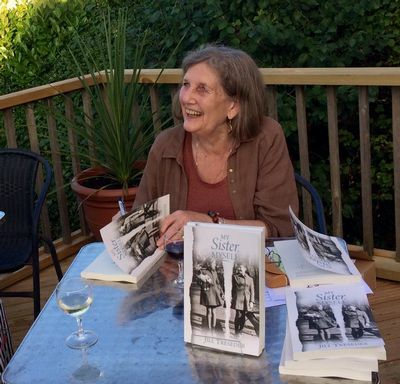 My Sister, Myself is Jill's fifth self-published novel with SilverWood. Spanning the 1940s to the 1970s, it is a work of historical drama that follows two sisters, Marika and Katalin, as they flee from Hungary in the aftermath of the 1956 Uprising to settle in the UK, and topically, it touches on the plight of today's refugees. The concept was prompted by a visit to the town where Jill attended school, when memories emerged of a Hungarian refugee's arrival in class, and the difficulties she had settling in alongside Jill and her classmates. From there, the novel evolved into a rich study of character and family bonds, layered with themes of prejudice, ambition, tragedy, rejection, identity, secrecy and desire. As well as a wish to understand the young girl who had landed in Jill's school in 1957, the book became a way to make peace with the past. As with Jill's other books, My Sister, Myself involved a significant amount of research. "The Hungarian political situation was extremely complex and it was important to get the background facts in order. It's been part of the process for all my books - making sure the background is solid, whether it's from my personal or professional experience or finding experts to educate me and help fill in the gaps." Having authored five novels, Jill now has a stack of self-published books that she is immensely proud of - My Sister, Myself; Becoming Fran; The Saturday Letters; The Hatmaker's Secret; and A Place of Safety. "The books aren't a series but the way SilverWood has linked them together through style has given them a cohesive identity - an identifiable brand for me as an author," enthuses Jill. Working with SilverWood has also given Jill the chance to issue a second edition of The Hatmaker's Secret and bring it up to a standard that she feels fits with the rest of her novels. She was able to incorporate suggestions from readers during the structural edit; an encouraging process because she could see how she'd become a better writer. "SilverWood gives you control of the process. So you get the book you want, and that's a real joy. My only regret is that I didn't start writing fiction sooner." Jill's books are available through Amazon, SilverWood Books, and local bookshops in Devon and Marlow, Buckinghamshire.